Not so long ago, this vital work was carried out by the forestry industry – at little or no cost to the taxpayer. But then the environmentalists successfully made “logging” a dirty word. And suddenly that vital management came to halt. In the name of saving the environment these eco-fascist ideologues, Gaia-worshippers, bandwagon-jumpers, hucksters, virtue-signallers, anti-capitalists and brain-dead bleeding hearts have actually helped to kill it. And not just the environment. 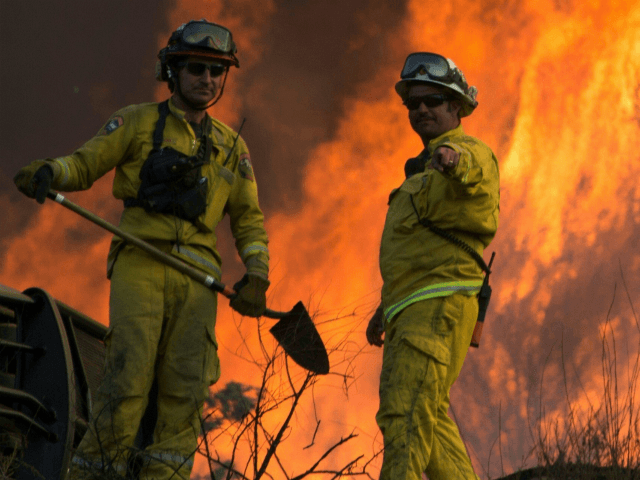 Their misguided, misanthropic, junk-science-driven policies have actually claimed human lives – such as the two firefighters who were killed battling the Ferguson Fire in California’s Mariposa County. As well as killing people, these greenies have also killed jobs, communities, local economies; they have killed wildlife and trees that need never have been destroyed on such a scale. These greenies have blood on their hands. And they have done nothing to benefit the natural world they claim to respect. But finally, the United States has an administration with the insight and the will to take on these monsters – who for decades have been doing so much harm to America’s economy, environment and people. Secretary of the Interior Ryan Zinke is a shining example of this new breed – as he demonstrates in this opinion piece for USA Today. There are currently about 100 wildfires burning across the west, forcing tens of thousands of people to evacuate. Many have lost all but the clothes on their backs. We are just now hitting the peak of a traditional fire season and already this year we have seen about 5 million acres of land and thousands of structures destroyed. We’ve lost friends and neighbors, including firefighters who dropped everything to respond to the call to duty. Their service and sacrifice will never be forgotten. The fires are burning hotter and more intense, due in part to hot and dry weather and in part to the fuels that overload our forests. These fuels fill forests from the floor, where highly-combustible, dry pine needles act as kindling to jump-start the tiniest spot fire, all the way up to the crown where beetle-killed trees dot the mountains like matches. In between the floor and the crown, there are years’ worth of dead logs, overgrown shrubs and snags, which many firefighters call “widow makers” because they are so deadly. The buildup of fuels is the condition we can and must reverse through active forest management like prescribed burns, mechanical thinning and timber harvests. Zinke has nailed it. This isn’t Republican buck-passing – as the left would no doubt wish to characterize it. It’s a plain-spoken acknowledgement of a festering evil which should have been addressed decades ago: the capture of America’s landscape and huge swathes of its natural resources by deep green, anti-capitalist, anti-human ideologues – heavily backed with money from liberal billionaires like Ted Turner. The western United States used to have a thriving forestry industry. Not any more. Not after the eco-fascists managed to regulate it out of existence – often on the most nonsensical of pretexts. Remember, for example, all the fuss about the Northern Spotted Owl? This fragile creature was allegedly so sensitive that it could only breed in old-growth forest, so apparently justifying the shut-down of the forestry industry across vast tracts of forest in Washington, Oregon and Montana. Environmentalism kills jobs, kills nature, kills people. We should never forget this. Nor should we forget that it’s generally conservatives – who understand and live with nature, whether as farmers or hunters or landowners – who make the best conservationists.